Around downtown Charlottesville’s brick-lined pedestrian walking mall, two things were in abundance on Saturday: heavily armed police and television cameras. Today marks a year since neo-Nazis, white nationalists and other racists held an unsanctioned march with tiki torches and chants of “Jews will not replace us” at the University of Virginia in Charlottesville. The following day, “Unite the Right,” a rally involving many of the same figures at the city’s Emancipation Park, turned deadly when a racist drove his car into a crowd of counter-protesters, killing 32-year-old paralegal Heather Heyer. The city was on high alert for similar violence on Saturday even though plans for “Unite the Right 2” have been moved to Sunday, August 12, in Washington, D.C.
Virginia Gov. Ralph Northam and the city declared states of emergency in advance of the anniversary. The declaration along with the city’s own preparations resulted in a heavy police presence, and much of downtown was blocked by barricades and police cars. Officers restricted access to the walking mall to two entrance points, checking bags and confiscating weapons and other banned items from people entering. But many private organizations and people in Charlottesville were using the anniversary to spread messages of love and hope. Businesses downtown were open as usual with local residents, media from around the world, and local and state police wandering the popular 10-block walking mall. Signs were posted saying “(Heart) Charlottesville” and “(Heart) Heather.” At the Whiskey Jar bar and restaurant, the chalkboard sign encouraged people to partake amid the anniversary preparations. “Good whiskey is stronger than fear,” the sign said. “People are determined,” said Phyllis Hunter, owner of the Spice Diva Emporium near downtown. “This is going to be a good day,” said a Charlottesville resident wearing a “(Heart) C-Ville” T-shirt, shopping and observing the activity. 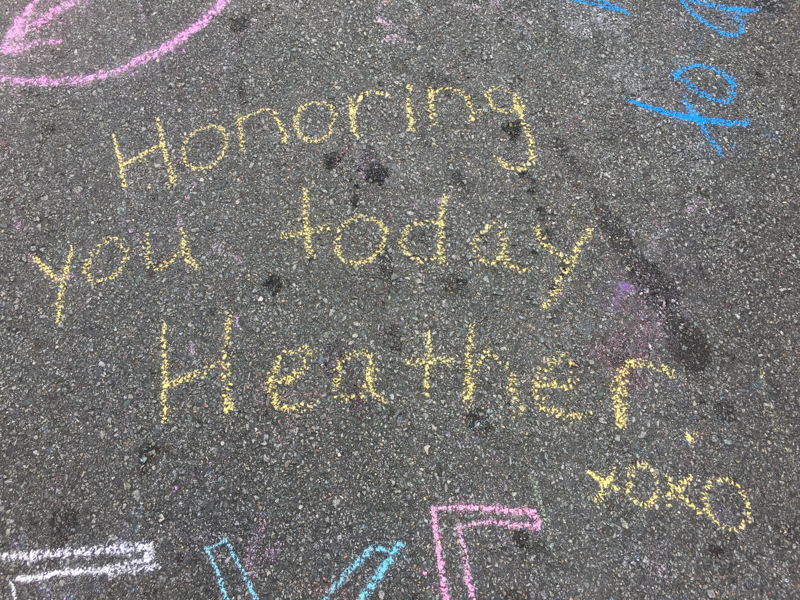 On Friday, a memorial marking Heyer’s killing was the most obvious sign of the previous year’s rally in an otherwise calm city. Atop 4th Street in downtown Charlottesville, chalk etchings lined a wall pointing to the intersection at the bottom of the hill where Heyer died. Visitors often scrawl chalk messages of remembrance and support on the brick walls lining the now infamous street, leaving behind a growing memorial of flowers, posters and candles. Heyer’s mother, Susan Bro, spoke to media at the site, talking about her daughter and how she hoped this would be the only anniversary of her death that would require heavy security. “This is where I come to absorb the energy of my daughter,” Bro said. A 21-year-old man from Ohio faces first-degree murder charges and federal hate crime charges for allegedly plowing his car into the group of counter-protesters and killing Heyer. “The killer sped this way, pray for him too,” someone wrote in purple on the brick sidewalk. The local businesses that populate downtown Charlottesville — and it is almost all local businesses, no Starbucks or chain restaurants in the 10-block area — did brisk business Friday night with only small acknowledgements of the tragic anniversary the weekend held. By late in the night, city officials and police put barricades in place and started to close streets around the mall, causing traffic to be rerouted and parking to be limited in the area. The police came under withering criticism after the 2017 rally but appeared to be trying to ensure that any racists seeking to make a public stand would be kept in check this year. Police planned to limit access to the downtown mall through two heavily guarded entrances. The University of Virginia blocked off most access to the Rotunda and famous statue of the school’s founder, Thomas Jefferson. Multiple barricades and volunteer “ambassadors” from the school stood watch over the area, the site of last year’s tiki torch march. “Too bad this is necessary because of a neo-Nazi invasion last year,” said Larry Sabato, director of the University of Virginia Center for Politics. Photo at top: Heather Heyer's mother, Susan Bro, speaks to the media on Friday, August 10, in Charlottesville.